Sialorrhoea is a common and problematic symptom that arises from a range of neurological conditions associated with bulbar or facial muscle dysfunction. Drooling can significantly affect quality of life due to both physical complications such as oral chapping, and psychological complications such as embarrassment and social isolation. Thicker, tenacious oral and pharyngeal secretions may result from the drying management approach to sialorrhoea. The management of sialorrhoea in neurological diseases depends on the underlying pathology and severity of symptoms. Interventions include anticholinergic drugs, salivary gland-targeted radiotherapy, salivary gland botulinum toxin and surgical approaches. The management of thick secretions involves mainly conservative measures such as pineapple juice as a lytic agent, cough assist, saline nebulisers and suctioning or mucolytic drugs like carbocisteine. Despite a current lack of evidence and variable practice, management of sialorrhoea should form a part of the multidisciplinary approach needed for long-term neurological conditions. Problems due to oral secretions are common and can be distressing in several neurological conditions. Oral secretion-related symptoms can result from saliva, which may vary in consistency from thin and watery to thick and tenacious, but may also be caused by secretions originating in the nose, throat or lungs.1 The picture is often mixed and its management requires a range of treatments. For example, muscle weakness in the face leading to poor lip seal may cause problems with drooling but with evaporation from the mouth leading to thickened saliva from the outset. Alternatively, thick secretions may be the direct result/side effect of the treatments given for managing sialorrhoea. These situations can make management complex, but the aim should be to achieve a balance of symptom control that best improves the quality of life for the patient. Evaluating the type of secretions the patient is suffering from, that is, sialorrhoea, thick secretions or both; consider the impact of saliva collecting at the back of the oral cavity. The cause of the symptoms, that is, does the patient have dysphagia, poor lip seal, learning difficulties, and is there any possibility that the patient has anatomical abnormalities or salivary hypersecretion. The timing of the problem. Although unstudied, physiology suggests that if a patient has symptoms throughout the day, then targeted therapies such as botulinum toxin and radiotherapy may need to include the submandibular gland, while if they have symptoms mainly when eating or drinking, treatment of the parotid glands may be more successful. 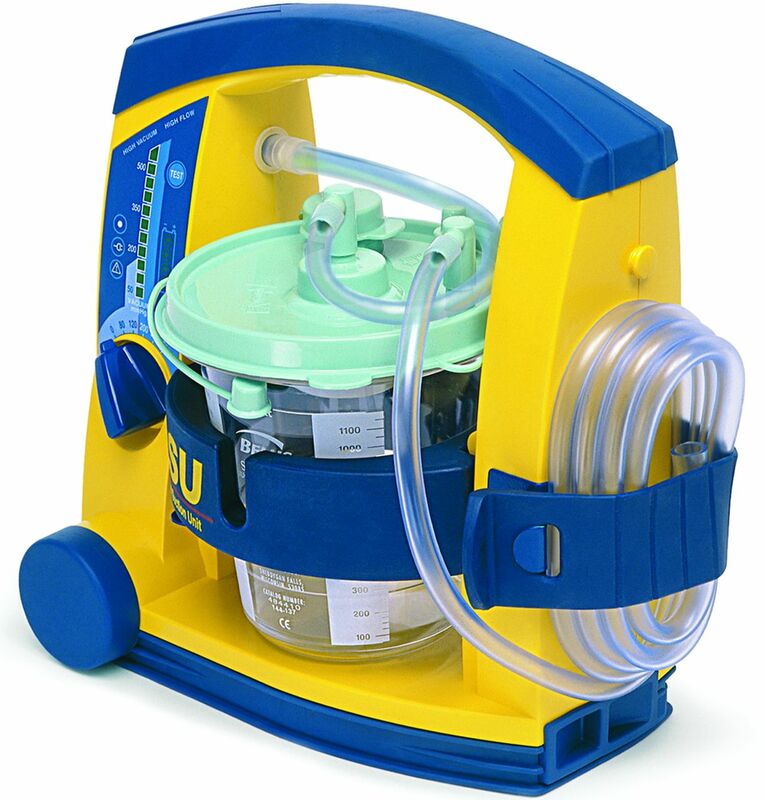 Whether secretions are impacting on the ability to use non-invasive ventilation. What steps have already been taking to try and manage the problem and what other medications they take. There are many proposed methods to evaluate oral secretions systematically. Quantitative measures such as weighing cotton rolls and collection cups are largely impractical but can assess reductions in salivary flow. However, such assessments correlate poorly with subjective symptom improvement and so are of little use in clinical practice.16 There are several patient reported and observer reported symptom rating scales. Most of these focus on drooling, but some also include questions assessing other sialorrhoea-related symptoms, subjective impact on other aspects of life and concurrent thick secretion problems.17–19 This lack of an effective or uniform outcome measure for evaluating oral secretion problems is a significant barrier to the generation of good evidence. 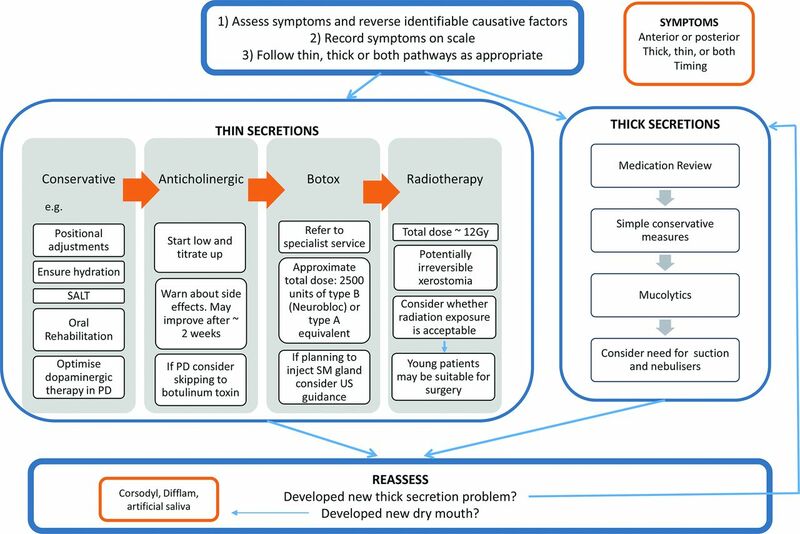 A suggested generic management approach to a patient with symptoms relating to oral secretions. This management approach is derived from expert clinician experience. PD, Parkinson’s disease; SM, submandibular. Although there is little evidence confirming their effect, there are various available conservative measures for managing sialorrhoea and associated symptoms. The appropriate use of these conservative managements will vary between patients. Portable suction devices can be considered in patients with treatment-resistant symptoms, particularly if they have pooling of saliva in the throat. While these devices are portable they are not necessarily discrete and patients may find using them embarrassing (figure 2). Glycopyrronium has a structure which means it does not cross the blood–brain barrier as readily; its use as an oral solution has been trialled in 23 patients with Parkinson's disease, showing symptom improvement and a good side effect profile.30 We need more research to determine the appropriateness of anticholinergics in this population and for the reasons outlined above, early consideration of botulinum toxin injections may be appropriate. The optimal doses and delivery mechanisms for these treatments have not been identified; however with a high risk of side effects, the approach should be to start at a low dose and titrate up as required and tolerated. External beam radiotherapy using photons or electrons is an alternative method for controlling sialorrhoea. It is usually used following the failure to respond to or tolerate treatment with anticholinergic drugs and botulinum toxin. There are several retrospective and prospective studies, carried out in patients with Parkinson’s disease and motor neurone disease, reporting objective reductions in saliva production and improvements in patient symptoms.34 While these studies did not include control groups, the same patients had previously failed to achieve symptom control with other available treatments for sialorrhoea. As with botulinum toxin injections, there is no consensus about the optimal dosing regimen for salivary gland irradiation to treat sialorrhoea. Most commonly used regimens target both submandibular glands and the caudal two-thirds of both parotid glands. Studies to date have used a range of doses, with a median dose per fraction of 5 Gy (0.83–8 Gy) and a mean total dose of 12 Gy (3–48 Gy). The length of the effect of radiotherapy is variable and was reported to last for several months to 5 years, with around half of patients still experiencing effects at 6 months. Radiotoxicity can occur resulting in an overly dry mouth with more viscous saliva, facial erythema, pain and nausea.34 These effects are usually short lived and the risk of their development is likely to be reduced with new techniques, such as CT mapping which allows for highly localised therapy.35 Because many of the patients with neurological disease have a short life expectancy, there is less concern about malignancy; however, in those with longer life expectancy this may be an unnecessary risk. There are some effective surgical interventions for sialorrhoea. Options include removing the submandibular or parotids salivary glands, relocating or ligating the submandibular and/or parotid duct and transtympanic neurectomy.36 These surgical interventions have most commonly been used in neurologically impaired children with symptoms resistant to medication and botulinum toxin. Using surgery to manage sialorrhoea in older patients is rare and would only be considered after less-invasive approaches have failed. Many patients with motor neurone disease, Parkinson’s disease and other neuromuscular and neurodegenerative disorders do not have the functional reserve to tolerate surgical intervention. Additionally, life expectancy is often short and so there is less need for interventions that will work for many years. Symptoms related to thickened secretions often are difficult to manage, with the available treatment options more limited than those for sialorrhoea. If a patient is distressed by thickened secretions—from treating sialorrhoea—then titrating down to the smallest effective dose can be helpful. Discussions with the patients and carers about which of these opposing secretion problems is more troublesome will help to achieve the best balance for the patient. Sialorrhoea is common in several neurological conditions and the physical complications of drooling such as perioral chapping can lead to embarrassment and social isolation that significantly affect the quality of life. Sialorrhoea can be associated with problems with thicker, tenacious oral secretions; when this is the result of the drying management approach to sialorrhoea, a balanced approach is needed. Sialorrhoea can be managed using various treatments including anticholinergic drugs, salivary gland-targeted radiotherapy, salivary gland botulinum toxin and surgical approaches, which should be used in a stepwise fashion. There is currently a little evidence to direct optimal secretion management, but effective long-term management usually requires a multidisciplinary team approach and a combination of treatments.
. Salivary gland dysfunction and swallowing disorders. Otolaryngol Clin North Am 1988;21:649–61.
. Dysphagia and sialorrhea: the relationship to Parkinson's disease. Arq Gastroenterol 2013;50:42–9.
. Sialorrhea: a management challenge. Am Fam Physician 2004;69: 2628–34.
. Anticholinergic side-effects of drugs in elderly people. J R Soc Med 2000;93:457–62.
. C9 treatment of medically refractory sialorrhoea with electron beam radiotherapy (EBRT) to the parotid [Abstract]. Amyotroph Lateral Scler Front Degener 2015;16:6. Borasio GD , et al.
. Sublingual administration of atropine eyedrops in children with excessive drooling - a pilot study. Int J Paediatr Dent 2017;27:22–9. Provenance and peer review. Commissioned; externally peer reviewed. This paper was reviewed by Martin Turner, Oxford, UK.